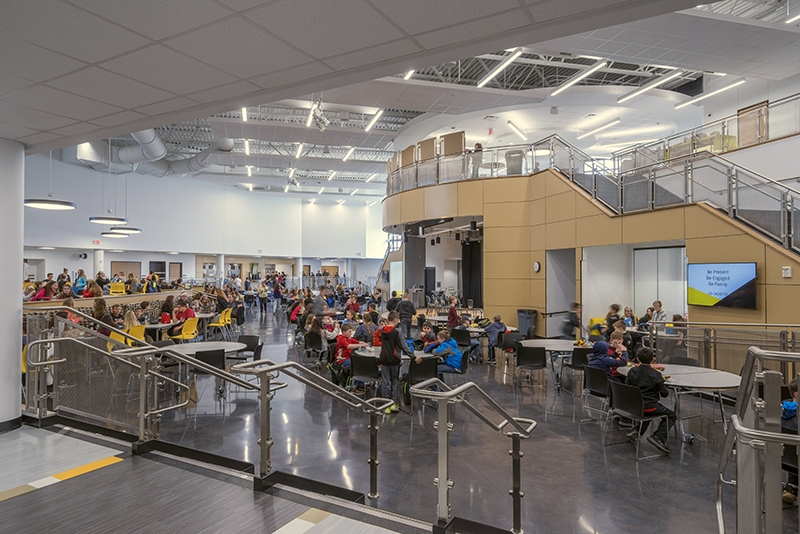 Hull Prairie Intermediate School | JDRM Engineering, Inc. 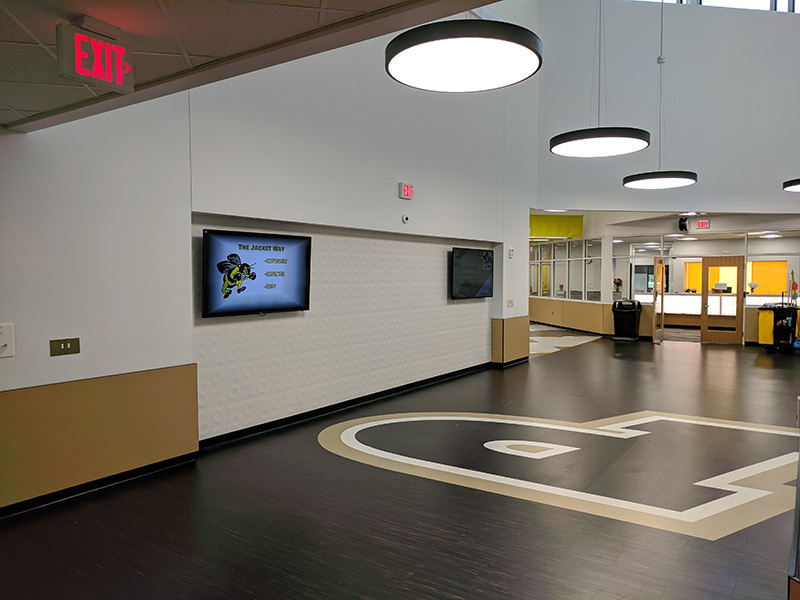 Designed to accommodate 900 fifth and sixth grade students, the new $28 million, 130,000 square foot facility for Perrysburg Schools is a two-story building with 32 classrooms, four special education classes, two S.T.E.M. 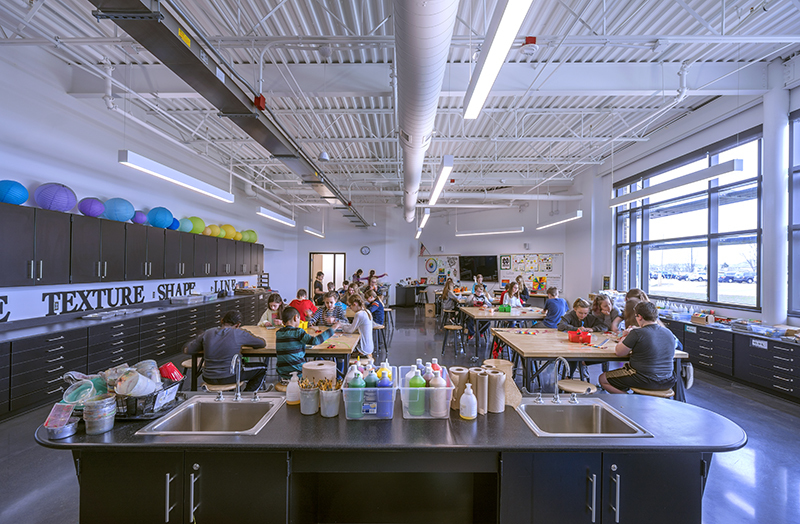 laboratories, four collaborative learning classrooms, and open learning spaces as well as band, vocal, orchestra, and art rooms. 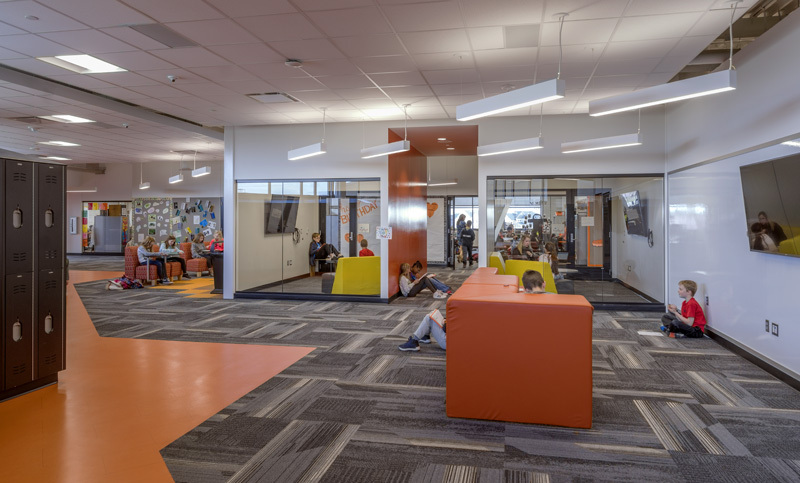 The goal of technology used in the school is to provide a flexible and open learning environment which allows students and teachers mobility and freedom to succeed in education. 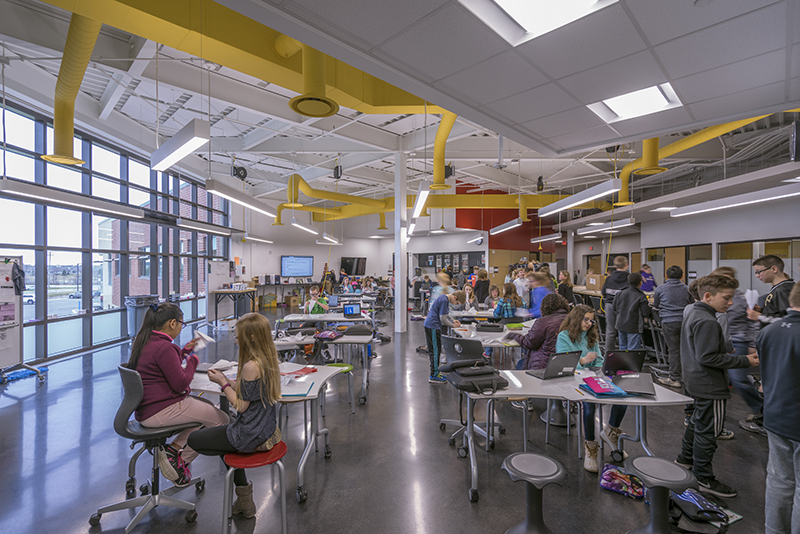 The general classrooms and art spaces are designed to support collaborative technology via wireless gateways allowing the teaching and students to wirelessly connect to the primary 65” HD monitor from tablets, laptops and other devices, and allow up to four (4) people to simultaneously show content on the screen. A secondary monitor is provided in the rear of the classroom for small group use. Voice reinforcement is also provided. Special education classes include an interactive HD monitor in addition to the equipment a standard classroom includes. 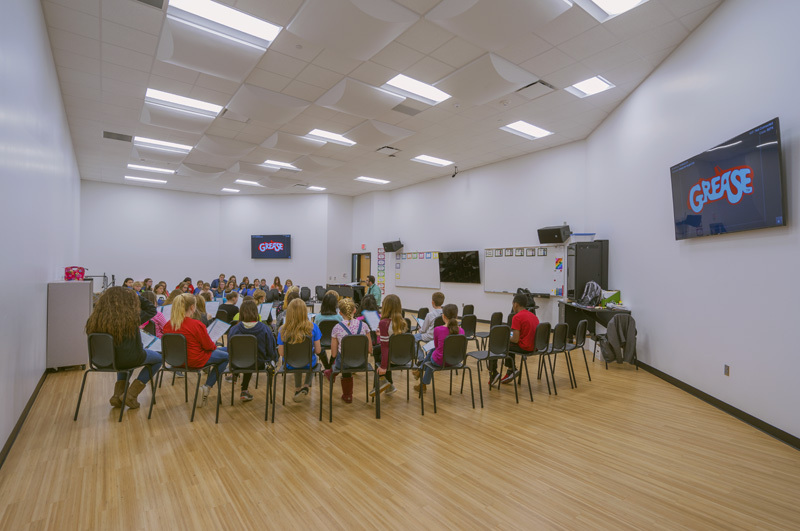 Music classrooms are also designed to support collaboration similar to general classrooms, but also include more specialized sound systems. 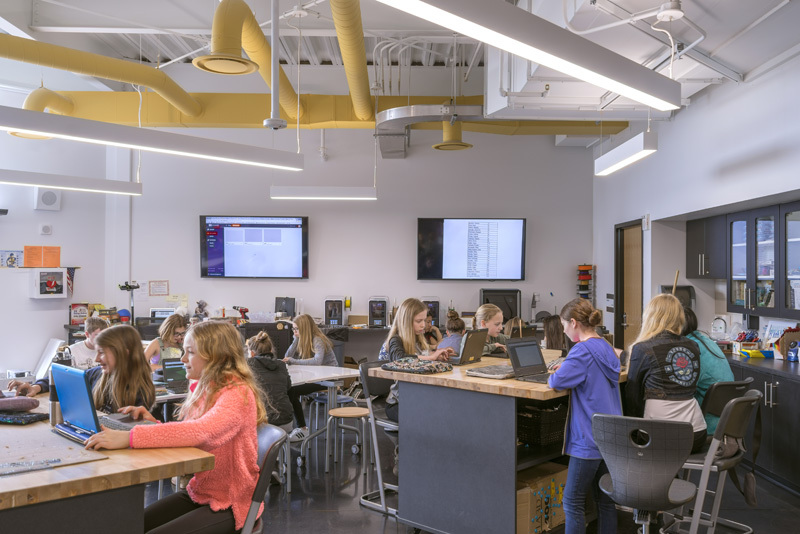 The STEM labs have multiple high-low monitor locations and areas for small and large groups to work. The collaborative learning classrooms contain an interactive HD monitor. Digital signage monitors are also provided. WLAN is provided throughout the building to support mobility for larger events, the gymnasium and a multipurpose area in the core of the building are equipped with video projectors, sound systems and associated controls. Provisions for a room scheduling system are also provided for future scheduling of conference and collaborative spaces in the building. IP Surveillance cameras are provided throughout the interior of the building to monitor corridors, entry ways, stairways, & other key areas. Cameras are also mounted on the exterior of the building to view the perimeter with two pole mounted cameras positioned at entry driveways to view vehicles entering the property. Cameras can be viewed via any authorized PC in the building, at a surveillance monitor in the Reception area, and remotely via authenticated login. A card access system is provided which integrates with the district wide access control system. Main entry vestibules are fully secured with entry to the building provided by valid key fob/card read or requesting entry via an intercom. Visitors are required to enter through the Administration area after being granted access by staff. Access to the rest of the facility is controlled by administrative staff. Panic and lock down buttons are provided for use during security events. A security microphone is provided in the Reception area for audio recording in addition to video recording of the area. The Access Control system is integrated with the Paging and Intrusion detection/burglar alarm system for alerts. The HVAC system for this facility is 400 tons of air cooled chiller plant, three high efficiency boilers at 2,000 MPH input each and 10 air handlers, eight of which are variable air volume units with fan powered terminals with hot water reheat. The units have chilled water cooling coils. The other two units are constant volume with hot water and chilled water coils in the units as they serve the gymnasium and the multipurpose space. The office air handler is VAV with DX cooling and terminal units with HW reheat. 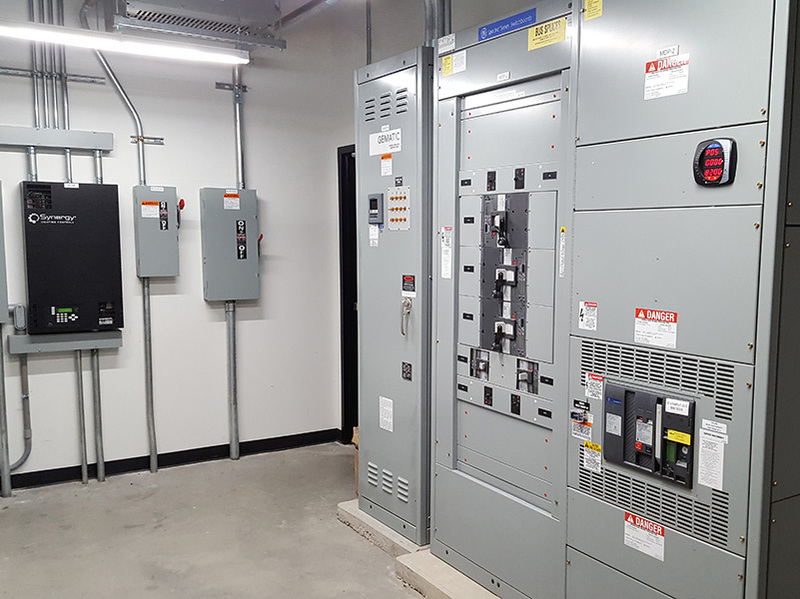 By this unit being DX, it can run when the office is occupied in the summer and the chillers can be off when the rest of the building is not occupied. Seven of the air handlers are coupled with energy recovery units to make the system operate more efficiently as a whole. The data closets are cooled by individual split system units to maintain the proper temperature year round. They systems are all to be tied together through a DDC Building Automation Control System. The lighting system incorporates 100% energy efficient LED sources and automatic control for maximum energy savings, control and flexibility. 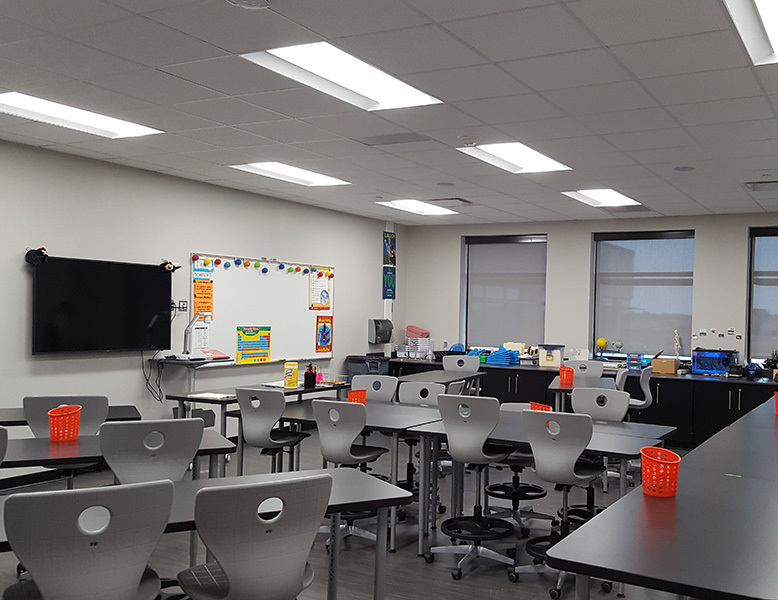 All classrooms have ultrasonic motion detectors for automatic control with local dimming. 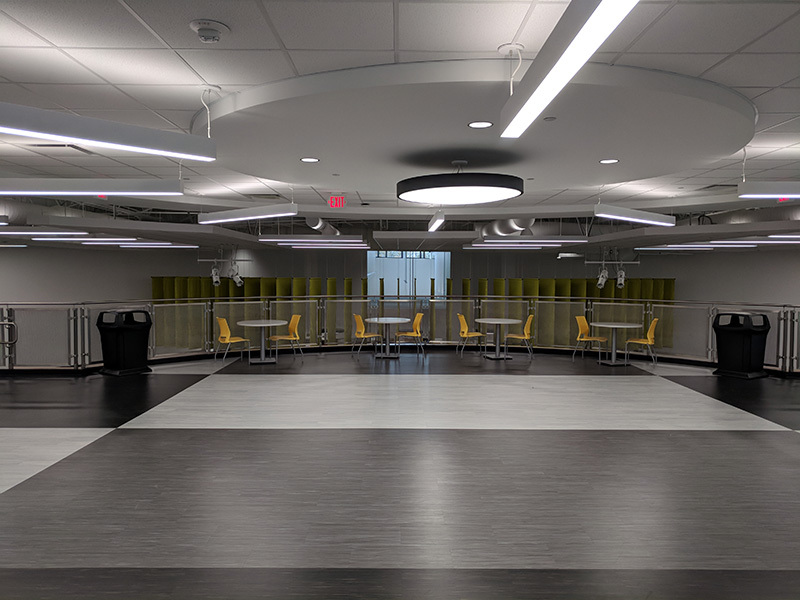 Corridor and large venue spaces including the Dining and Gymnasium areas are controlled by a low voltage relay lighting system with programmable timing control. ASHRAE 90.1 interior and exterior watt density levels have been met for the entire complex. Exterior parking area watt densities are under the ASHRAE 90.1 levels by 22.2 KW. Transformers in the facility are TP-1 high energy efficient design. 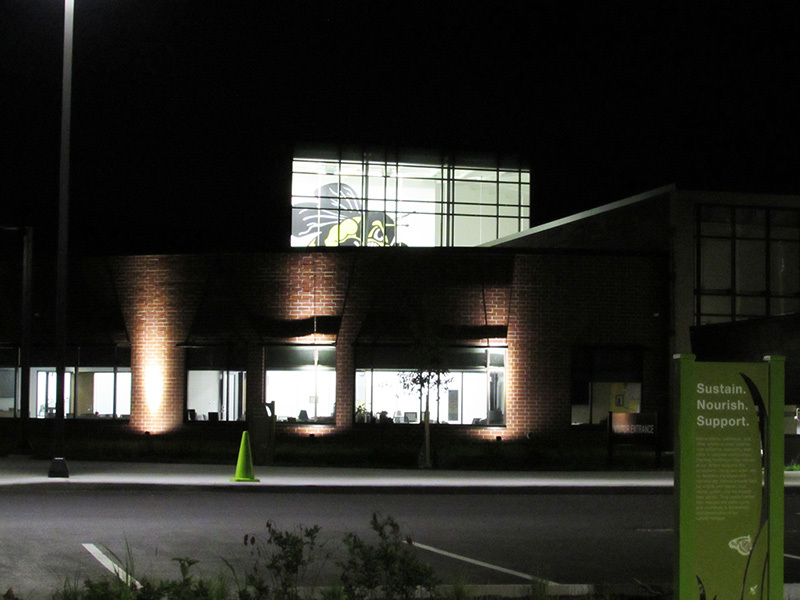 Exterior pole and building light fixtures are full cutoff with 0% light pollution shining upwards. Plumbing systems include; domestic hot and cold water, natural gas, storm, sanitary waste and vent. 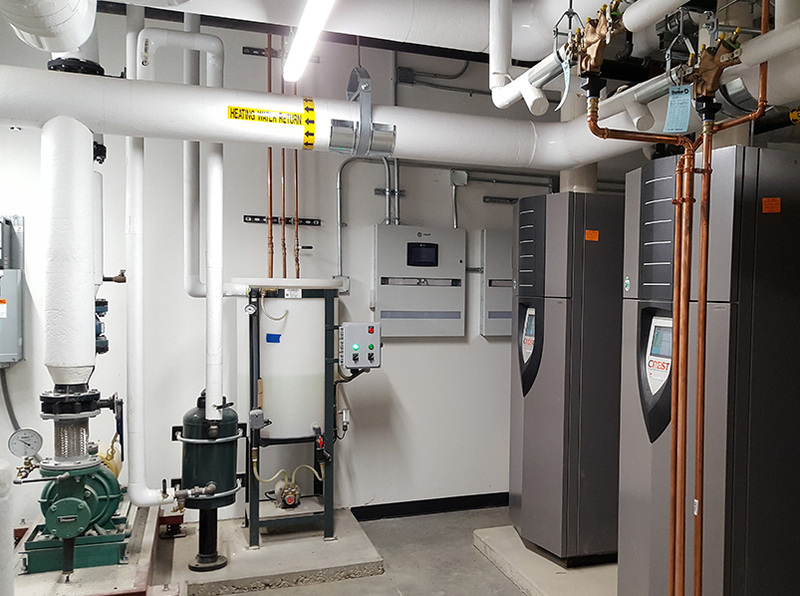 The primary domestic hot water system consist of a pair of stainless steel in-direct heat exchangers (storage tanks) connected to the high efficiency heating boiler system. A dedicated pump circulates heating water from the HVAC boilers, through stainless steel coil inside the storage tank, heating the domestic water for both the kitchen and locker rooms. Smaller, electric water heaters are installed in the classroom portion of the building to serve the hand sinks and public toilet rooms. Natural gas from the local utility has been tapped and the service line is run to meter setting, near the building. Gas piping extends to serve the natural gas-fired emergency generator, kitchen equipment, boilers and make-up air equipment serving the kitchen. Emergency shut-off valve has been provided at the kitchen exhaust hood which is connect to the fire suppression system and will close automatically in the event of fire below the hood. Ground water is collected around the perimeter of a recessed portion of the building and a duplex storm water pump located in a Custodial Closet, lifts the water so it may be connected to the rain water conductors and out of the building. A simplex pump is provided in the elevator pit to remove water that would collect in this area. Primary and secondary roof drains are provided to remove water from the roof. Secondary drains discharge above grade and the primary drains flow away from the building below grade. There are downspouts and gutters on portions of the building. Sanitary drain piping exits the building in multiple locations. Grease waste from the kitchen is piped through a solids interceptor and a grease interceptor located outside of the building, near receiving. Small solids interceptors are installed inside of the base cabinets in the Art Classrooms. The building is fully sprinkled. Concealed sprinklers are provided where there are finished ceilings. A dry pipe sprinkler system is provided for Outdoor Storage, Receiving and has also been installed in the main electrical rooms.